This free work order template is Excel-based, designed for small businesses that need an easy way to create work orders, job orders, job tickets, work tickets or service tickets but is not ready for a complicated work order system or program. This free work order template offers a printer friendly work order form that is fully customizable for all your Work Order needs. As you can see, a work order should include elements that help the person or people who will be fulfilling the work order to know exactly what the customer wants done or wants delivered, including how many units and details relating to things such as size, shape, color and other important options. Our work order template was designed specially with these requirements in mind, and includes fields 'Date Completed', 'Hours Worked', etc. The free Work Order Form Template is in Microsoft Excel format. This allows you to use various tools provided by Microsoft Excel to further customize the work order form by using it as a starting point or sample work order form. While it is mainly focused on service, repair and maintenance work, creating your very own work order form from the default work order form can be easily done by moving the cells and modifying the labels. A work order is also called job order, job ticket or work ticket, as it often has some type of ticket attached. Unlike an invoice, a work order can also be created internally within the organization. A work order may be for products or services. This free work order template allows you to list both products and services. In a service environment, a job order can be the equivalent to a work or service order where the job order records the location, date and time the service is carried out and the nature of service that was carried out. 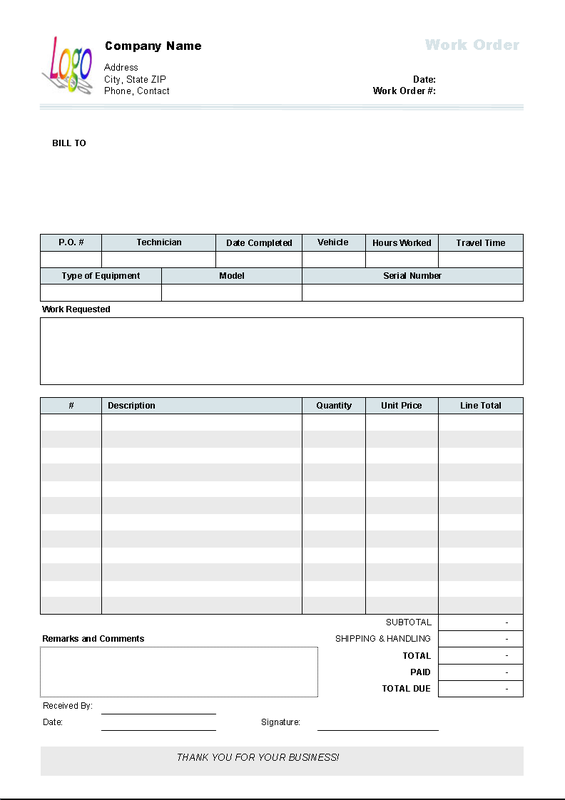 By default this work order form can be printed on standard A4 paper that is supported by most printers today available. If you need to change the print options, open the Page Setup or Print dialog boxes. If you change the paper size, make sure all the content is printable by print-preview the document in Excel. Hope this simple work order template can help you create professional business documents that are professional and beautiful. This appears to be very simple to use.